It is my Mom’s birthday today; June 10, 1924. She would have been 89 had she lived beyond 83 years. She was a Gemini. My natal moon is in Gemini, always a sweet relationship having a moon in mother’s sun sign. We had a New Moon in Gemini on June 8 at 11:58 am Eastern time. And with the New Moon I like to cast an I Ching Gua to get a sense of the energies for the upcoming moonth, the next 29 days or so. 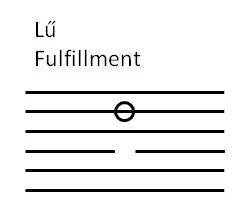 The initial Gua this moonth is Lü which means fulfillment according to Alfred Huang in his The Complete I Ching. This Gua is related to shoes and walking. For me it means “stepping out” into one’s duty, calling, purpose. And in a large way I have begun to step out. I’m off to a really good start with my two Qigong classes which I kicked off in the past week. I don’t have large groups yet, but they are already growing and the paying participants are more than covering my costs. I’m happy with these results. I also related in posts last week that I am no longer hiding my talents and my accumulated skills and wisdom. Now is a good time to move firmly into action, fulfillment and purpose. How are you stepping out into your purpose? The energies of this moonth will support you as you do, especially during the first part of the period. Note that the fifth line of the initial Gua is a changing line: the nine, yang line, changes to a yin line. 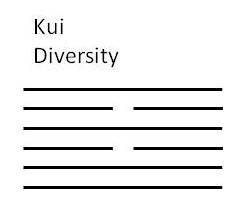 This creates the approached Gua: Kui, which means Diversity according to Master Huang. This change impacts the energies and brings a cautionary note with it: the fifth position in the Gua is a yang position, which is proper, strong; its change to a yin line may bring adversity: being steadfast and holding to purpose rigidly can lead to adversity. That said, in diversity there can be great harmony with the proper attitude. Find common ground on the big things and all the little differences will blend and disappear. In diversity there can be great strength. How do you handle diversity in your life? Do you resist change? Do you back down from confrontation? So as the moonth unfolds watch for the shifts from “fulfillment” to “diversity.” This may mean a strong purposeful beginning to the moonth with a gradual shift as the energies change to scatter that directed energy and bring about diversity. And as this happens watch for the opportunities for harmony, the strengths in diversity rather than the oppositions. Hold to an attitude of cooperation and resist the temptation for stubborn resistance. There will always be differences as long as there are two or more humans involved in any issue. Blend the small differences because they are inconsequential; harmonize the major differences and gain strength from the symphony of ideas! PS: Qigong continues this evening, Monday, June 10 at 7:00 pm. If you are in the area of Annapolis/Severna Park, Maryland, please join me: Details here. INSPIRATION FROM ROSEMARY: Exquisite Moments in Life What Are You Hiding?